For Red Tree Builders’ Brandon and Amanda Bryant, their ultimate goal was not only to build houses that they could still be proud of many years later, but also to build a small family that could withstand the stresses and rigors of modern life and thrive. There is a photograph, saved somewhere on a laptop in Brandon and Amanda Bryant’s majestic North Asheville home, that shows the moment in 2017 when Brandon was inducted as the president of the Asheville Home Builders Association. His wife, Amanda, who co-owns Red Tree Builders with him, is on the stage to help with the induction. As Brandon raises his hand to take the oath, the couple’s small daughter, Charlee, runs to the stage and raises both hands to take part in the ceremony. That moment shows so much about the young, energetic, and entrepreneurially-minded family that has turned their company into a concierge builder and takes their slogan—Artfully Crafted, Beautifully Made—to heart. 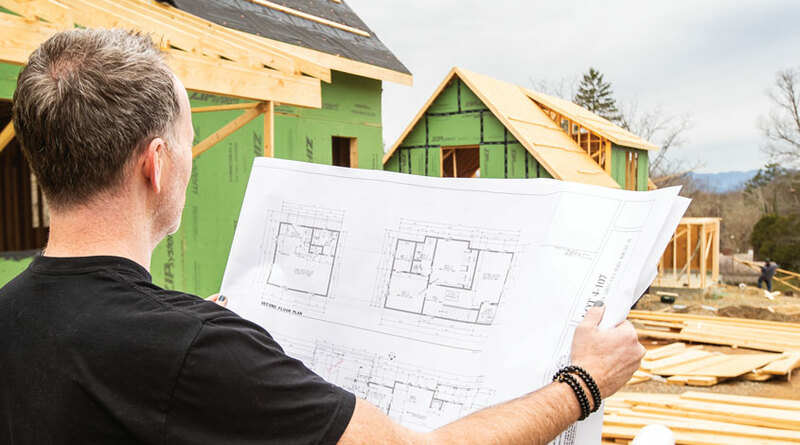 That familial spirit is what sparks how Red Tree Builders, the construction company that focuses on custom-built, eco-luxury green-built homes, engages with its clients and with each project. The Bryants and their staff want to make sure that when a project is complete, it is worthy of being a Red Tree home. As with every great artist, the company signs its work, but instead of a looping signature on a hidden 2×4, it is done on a metal placard placed discreetly somewhere on the property. Business has grown in recent years for Red Tree Builders. There was a 132 percent increase in revenue from 2016 to 2017, and a 38 percent increase the following year. This company doesn’t plan to make the jump into mass production; it wants to continue to provide personal service and a personal touch.